Montana Dogless No. 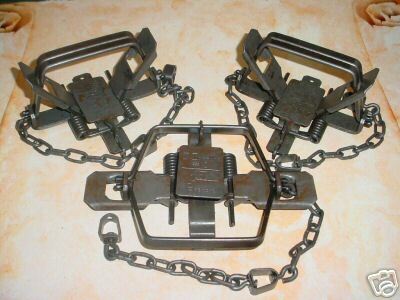 3 coil spring traps. Ideal for coyotes and bobcat. Comes complete with the dogless trigger system. Heavy Duty chains and swivels attached. This trap features regular jaws (standard). Features rolled edge jaws. No sharp edges. #3 Music wire springs. #3 straight link machine chain. 6" jaw spread. Note: Additional shipping charges may apply to zip codes beggining with 7,8,9.